When creating a web site for the first time it’s important to keep in mind that your web site represents you and/or your business. We work with our clients to create the best online presence possible. 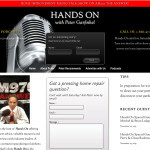 Our example, thehandsonshow.com, has been created using WordPress and uses the same colors as the radio station where the show airs live on Saturday mornings, 7-8am.